June 8, 2015 June 8, 2015 ~ Trevis Dampier Sr. So me and fiance are in Half Moon Bay to finish up on some last minute wedding meetings before the big day at Oceano Hotel and our stomachs are rumbling and we are ready to eat. When you are this hungry, anything will taste good but I need it now and I need it fast! We look and see a melody of fresh air when we see the large restaurant on the corner called Flavor – Coastal Comfort Food. Flavor to me sounds just what I need and add in some comfort to that and you got a winner! Let’s see what this is all about.. So right when you walk in there is a bar downstairs with an elegant exotic feel to the place. You walk up these rounded stairs to be seated looking over the bay with a great water view on the back side of the restaurant. They only serve certain dishes at certain times so be aware of that. Looking on Yelp won’t help you to get a dinner plate at 11am so be prepared for breakfast and lunch entrees only. Outside of that, the lunch selection seemed to be mostly sandwich based meals so make sure you want to bite into something holding two hands and juices dripping all over your chin when you go to this shindig. Today I am going for something that makes my ears tingle hearing about it and my throat tingle when I taste it. Just a happy tingling moment of delicate sensation! 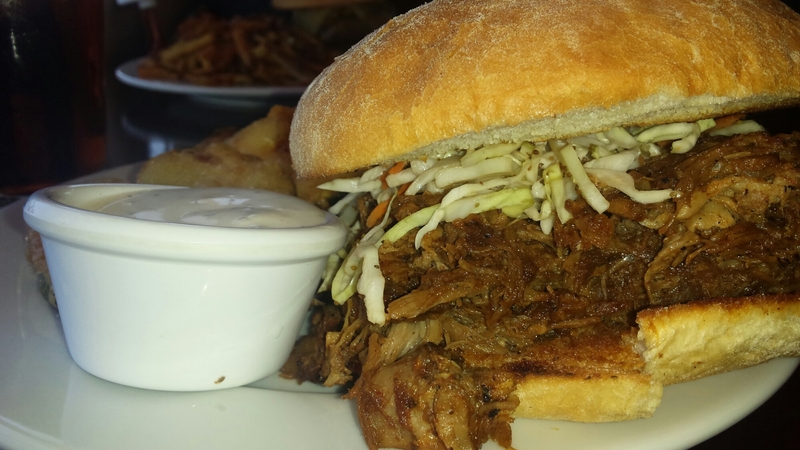 Today I dive into Roasted Pulled Pork with house made bbq sauce & celery seed slaw on a burger bun. I also added fried zucchini chips with ranch dressing. Yum! First of all when this thing arrived it almost covered the entire plate! They are not stingy at all! A piece of the pork was lying on the plate outside of the sandwich winking at me so I figured why not give it a little taste test. I popped that little piggy in my mouth and instantly shots were fired! Shots of sweetness, tanginess and soft tender pork satisfaction all attacked me in one moment! I grabbed this monster masterpiece and dove right in! Again I was hit with sweetness, tanginess and soft tender pork satisfaction with a slight crunch from the celery seed slaw! Bite after bite..Kaboooom! Kaploooow! More and more flavor on top of flavor! True live action eating! One tip I would have to say to Flavor is to add some side items for the accessory sandwich lovers; pickled relish, pickles, jalapenos, etc. This would have made this pork sandwich the best thing I have ever had with just a few more add ons. Outside of that; this was one fantastic succulent masterpiece of flavor packed goodness! Flavor! < Previous Holy Moly! Please Give Me More Rangoli! Next > Words can’t express, Thai food at its best!